Hacienda is a strategic family board game and a type of area control game where players must aim to have the biggest and best hacienda in Argentina at the beginning of 19th century. 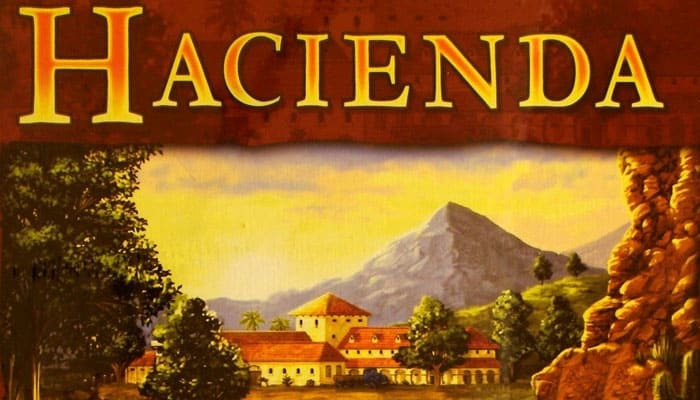 To win the game, the players must acquire land and animals, open new markets, build haciendas and worry about water supplies and harvests to gain the most points. You have a hand of cards and you play these cards to place tiles on the board. Use your land cards to get more land tiles but always try to keep your land tiles together. The more spaces you control, the better your chances of winning. Place your animal tiles leading towards the markets on the board to collect money when you sell them at the market. Watering the land and animals and placing haciendas on the longer chains of tiles will lead towards a victory. Hacienda offers you two game boards, each requiring a different strategy to win. The players are estanzieros (large landowners) in Argentina. They acquire land and animals, build estanzias (haciendas), harvest and sell animals at market. The winner is the player who has most important estanziero at the end of the game; that is, who scores the most points.